RBI Office Attendants Recruitment Results 2018 /RBI Office Attendants Recruitment 2017 Admit Cards / Call letters download/ RBI Office Attendants Recruitment 2017, Apply online from Nov 17: RBI Recruitment 2017 Apply online for Office Attendant Posts. 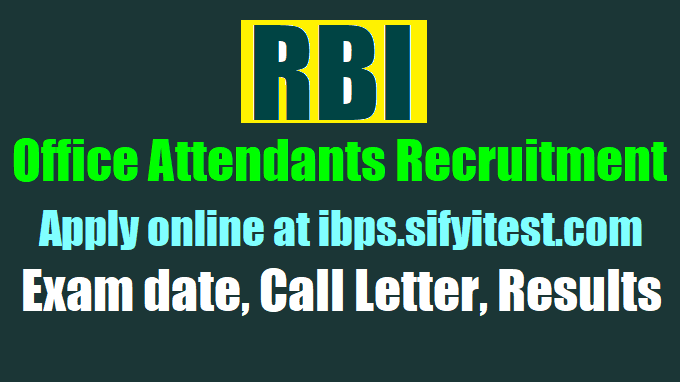 RBI Office Attendants Recruitment Preliminary Exam Main Exam dates, RBI Office Attendants Recruitment Call letter, RBI Office Attendants Recruitment Selection list results and more details @ RBI.ORG.IN. Recruitment for the post of Office Attendant: Reserve Bank of India invites applications from eligible candidates for 526 posts of “Office Attendants” in various offices of the Bank. Selection for the post will be through a country-wide competitive Test (Online Test) followed by Language Proficiency Test (in Regional Language). Please note that Corrigendum, if any, issued on the above advertisement, will be published only on the Bank’s website www.rbi.org.in. Full text of the advertisement is available on the Banks’ website www.rbi.org.in and is also being published in the Employment News/ Rojgar Samachar. Applications will be accepted only Online through the Bank’s website www.rbi.org.in. No other mode for submission of application is available. UPSC CSE prelims 2018 notification: Apply for 782 vacancies at upsconline.nic.in: RBI Declares Office Attendant Exam Result; Check Online. Reserve Bank of India (RBI) has declared the exam result for Office Attendant recruitment. Candidates can check the result at rbi.org.in. Reserve Bank of India (RBI) has declared the exam result for Office Attendant recruitment. Candidates can check the result at rbi.org.in. 'This list is provisional, subject to the candidates clearing biometric verification, Language Proficiency Test (LPT), being found medically fit and submitting acceptable documentary evidence,' reads the official update. Qualified candidates shall have to send required documents to the respective regional offices of RBI by courier/ speed post. RBI had conducted the exam for recruiting for 526 vacant posts. RBI had initiated the recruitment in November 2017. Selection for the RBI Office Attendant posts will be through a country-wide competitive Test (Online Test) followed by Language Proficiency Test (in Regional Language) as per the bank's recruitment rules. The exam was held in 5-6 January 2018. 'Candidates are also requested to take a print out of the relevant proforma. Duly filled-in proforma along with the certificates (as applicable) may be sent to The Regional Director, Human Resource Management Department at the addresses of the respective Recruiting Regional Offices appended below by Courier/Speed Post so that it reaches them on or before February 23, 2018,' reads the official update. The online exam comprised of online objective questions. Graduates and those possessing higher qualifications were not eligible to apply for the post. RBI had also conduct pre exam training for candidates belonging to SC/ ST/ OBC/ PWD categories. RBI had conducted online exam for Assistant post in November 2017. The Reserve Bank of India (RBI) has released the admit cards of office attendant online exam 2017 on the official website, the link for which is rbi.org.in. As per reports, the RBI Office Attendant exam 2017 will be held in the month of December 2017/January 2018. The online test could be conducted on weekdays or weekend. Also, RBI reserves the right to modify the number of days and dates of test depending on the number of applicants. Step 2. Scroll through the current vacancies tab and click on 'Call Letters link'. Step 3. Click on the admission letter and other guidelines link for the post you applied for. Step 4. Enter your registration number and password. Step 5. Click to submit and admit cards will be displayed on the screen. Earlier, RBI released an employment notification inviting interested, eligible candidates to apply for the positions of Office Attendant in various offices of the bank. - Pay scale: The selected candidates will be getting a monthly salary of Rs 10,940 to Rs 23,700. - Selection procedure: The candidates will be selected on the basis of an online test and a language proficiency test (LPT). For any query, candidates can visit the official website. RBI Recruitment for the Post of Office Attendant: Applications are invited from eligible Indian Citizens for the post of Office Attendant in Reserve Bank of India (RBI). Candidates may click on the link below for filling in the online application form. RBI To Recruit For Office Attendant Posts: Reserve Bank of India (RBI) has invited application for recruitment to Office Attendant post. A total of 526 vacancies are available in various offices of the Bank. Applicants should have completed the qualifying degree from the concerned State/ UT coming under the Regional Jurisdiction of the Recruiting Office to which he/ she is applying. Candidates will be selected on the basis of competitive exam which will be online based. The exam will comprise of online objective questions and language proficiency test. Graduates and those possessing higher qualifications are not eligible to apply for the post. Like IBPS, RBI will also conduct pre exam training for candidates belonging to SC/ST/OBC/PWD categories. 'Candidates belonging to the above categories who desire to avail themselves of such training may write to the Regional Office of the Reserve Bank of India to whom the candidate is applying.' Applicants must also be in the age group of 18-25 years. Candidates can submit their online application at the official website of rbi.org.in before 7 December 2017. The online test will comprise of questions from reasoning, general English, general awareness and numerical ability. It will be held in December 2017/ January 2018. 'The online Test could be conducted on weekdays or weekend. RBI reserves the right to modify the number of days and dates of test depending on the number of applicants,' reads the official notification. Candidates seeking age relaxation are required to submit copies of necessary certificate(s) at the time of LPT. i. Candidate's seeking reservation as SC/ST/OBC, shall have to produce a certificate in the prescribed proforma ONLY, meant for appointment to posts under the Government of India from the designated authority indicating clearly the candidate’s caste, the Act/Order under which the caste is recognised as SC/ST/OBC and the Village/Town the candidate is ordinarily a resident of. They must also ensure that the name of their caste/community and its spelling in their caste/community certificate should be exactly as mentioned in the lists notified by the central government from time to time (for OBC category list of castes recognized by the Govt. of India as OBC castes in the central list is available on the site http://www.ncbc.nic.in, for ST category the list of caste for each state is available on the site www.ncst.nic.in and for SC category the list of castes for each state is available on the site http://www.socialjustice.nic.in). A certificate containing any variation in the caste name will not be accepted. Further the OBC certificate should also clearly indicate that the candidate does not belong to creamy layer as defined by the Government of India for applying to posts and services under the Central Government. ii. The OBC claim of a candidate will be determined in relation to the State (or part of the State) to which his/her father originally belongs. A candidate who has migrated from one State (or part of the State) to another should, therefore, produce an OBC certificate which should have been issued to him/her based on his/her father's OBC certificate from the State to which he (father) originally belongs. iii. No change in the community status already indicated in the on-line application by a candidate for this examination will be allowed. Candidates seeking age relaxation are required to submit copies of necessary certificate(s) at the time of document verification. i) A candidate should have passed 10th Standard (S.S.C./Matriculation) from the concerned State/UT coming under the Regional Jurisdiction of the Recruiting Office to which he is applying (Refer Annex III). Such qualification should be from a recognized board. ii) In addition to the above, the candidate should be a domicile of the State/UT coming under the Regional Jurisdiction of the Recruitment Office to which he/she is applying for (Refer Annex III). Selection would be done on the basis of Online Test (as given below) and Language Proficiency Test(LPT). Online test except the test of General English will be in bilingual, i.e. English and Hindi. There will be negative marking for wrong answer in the Online Test. 1/4th mark will be deducted for each wrong answer. LPT will be of Qualifying Type. The candidates provisionally selected from the On-line Test will have to undergo a language proficiency test (LPT). LPT will be conducted in the Official / Local Language of the State concerned (Annex-I). Candidate not proficient in the Official/Local Language would be disqualified. Other detailed information regarding the test will be given in an Information Handout, which can be downloaded by the candidates from RBI’s website along with call letter. Roll No. of those candidates who have qualified for LPT on the basis of Online test will be displayed on RBI’s website in the month of January/February 2018. Date for LPT will also be displayed on the website along with a brief notice thereof. LPT is mandatory. No exemption of any sort will be given to any candidate from appearing in LPT, which will be conducted at respective offices. Final Selection will depend, on the performance in online test, qualifying in LPT, Medical fitness, verification of certificates and Biometric Data, etc. to the Bank’s satisfaction. Decision of the Bank in this regard, will be final. Helpline: In case of any problem in filling up the form, payment of fee or receipt of call letter, queries may be made at candidate grievance redressal cell http://cgrs.ibps.in/. Don’t forget to mention ‘RBI Office Attendant Test’ in the subject box of the email. Candidates can apply online only from November 17, 2017 to December 07, 2017 and no other mode of application will be accepted. i. Scan their photograph and signature ensuring that both the photograph and signature adhere to the required specifications as given under Guideline for photograph & signature scan and upload (Annex V). ii. Candidate should also ensure that photo is uploaded at the place of photo and signature at the place of signature. If photo in place of photo and signature in place of signature is not uploaded properly, candidate will not be allowed to appear for the exam. iii. Have a valid personal email ID and mobile no., which should be kept active till the completion of this Recruitment Process. Bank may send call letters for the Test etc. through the registered e-mail ID. Under no circumstances, a candidate should share with /mention e mail id to any other person. In case a candidate does not have a valid personal e-mail ID, he/she should create his/her new e-mail ID and mobile no. before applying On-line and must maintain that email account and mobile number. Staff candidates are exempted from payment of test fee and intimation charges. 1. Candidates may go to the RBI website www.rbi.org.in and click on the option "Recruitment for the post of Office Attendant" which will open a new screen. 2. Bank Transaction charges for Online Payment of application fees/intimation charges will have to be borne by the candidate. 3. The payment can be made by using Debit Cards (RuPay/Visa/MasterCard/Maestro), Credit Cards, Internet Banking, IMPS, Cash Cards/ Mobile Wallets. 4. After submitting your payment information in the online application form, PLEASE WAIT FOR THE INTIMATION FROM THE SERVER. DO NOT PRESS BACK OR REFRESH BUTTON SO AS TO AVOID DOUBLE CHARGE. 5. On successful completion of the transaction, an e-Receipt will be generated. 6. Non-generation of 'E-Receipt' indicates PAYMENT FAILURE. On failure of payment, Candidates are advised to login again using their Provisional Registration Number and Password and repeat the process of payment. 7. Candidates are required to take a printout of the e-Receipt and online Application Form containing fee details. Please note that if the same cannot be generated, online transaction may not have been successful. 8. For Credit Card users: All charges are listed in Indian Rupee. If you use a non-Indian credit card, your bank will convert to your local currency based on prevailing exchange rates. 9. To ensure the security of your data, please close the browser window once your transaction is completed. 10. There is facility to print application form containing fee details after payment of fees. Schedule of Online Test (Tentative) In the month of December 2017/January 2018. The online Test could be conducted on weekdays or weekend. RBI reserves the right to modify the number of days and dates of test depending on the number of applicants.